MRS. SULLEN: O, sister, sister! If ever you marry, beware of a sullen, silent sot, one that’s always musing but never speaks. Think now: He came home this morning at his usual hour of four and wakened me out of a sweet sleep by tumbling over the tea table which he broke all to pieces; after his man and he had rolled about the room, like sick passengers in a storm, he comes flounce into bed, dead as a salmon into a fishmonger’s basket; his feet cold as ice, his breath hot as a furnace, and his face as greasy as a raw pork chop. O matrimony. He tosses up the clothes, disorders the whole economy of my bed, leaves me half-naked, and my whole night’s comfort is the tuneable serenade of that wakeful nightingale his nose. But here he comes, and you shall see how handsomely he will beg my pardon. 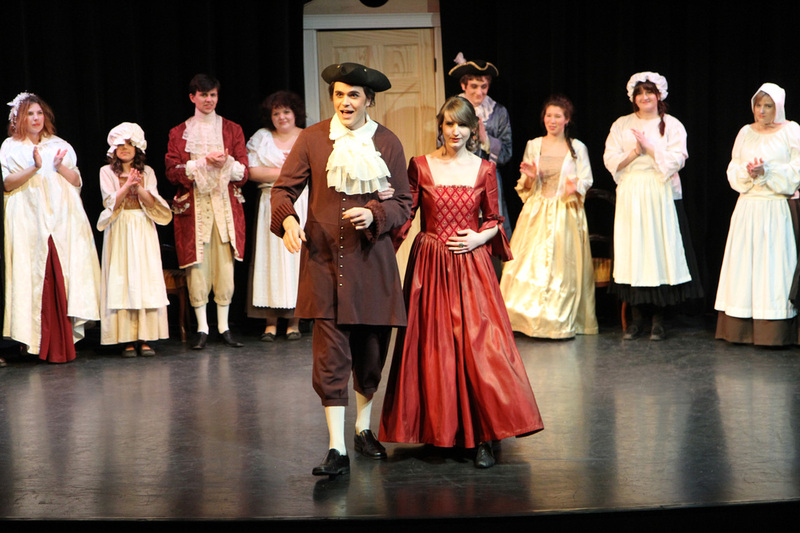 The Beaux' Stratagem tells the story of two young bucks who, having spent all their money by living too well, leave London and roam from town to town in search of love and fortune. In order to find a wealthy heiress for at least one of them, they pose as master and servant—exchanging roles from one town to the next. In Lichfield, Aimwell is master and Archer the servant, and there they meet the lovely, wealthy Dorinda and her equally desirable sister-in-law, Mrs. Kate Sullen. They set their caps for these women, but problems abound. Kate is married to a drunken sot who despises her; the innkeeper’s saucy daughter, Cherry, has set her cap for Archer; Dorinda’s mother, Lady Bountiful, mistakenly believes herself to be a great healer of the sick, and she guards her daughters like a dragoness; and a band of brigands plans to rob the house of Lady Bountiful that very night, putting all schemes in jeopardy. This is a play in the grand tradition of Goldsmith’s She Stoops to Conquer and Sheridan’s The Rivals and School for Scandal. It is classic, robust and hilarious. Poster designed by Okanagan College Writing and Publishing student Christina Herbert. The Beaux’ Stratagem was penned more than 300 years ago, but the humour, plot, characters and twists hold up, and the troupe performing this play is as fresh as they come. 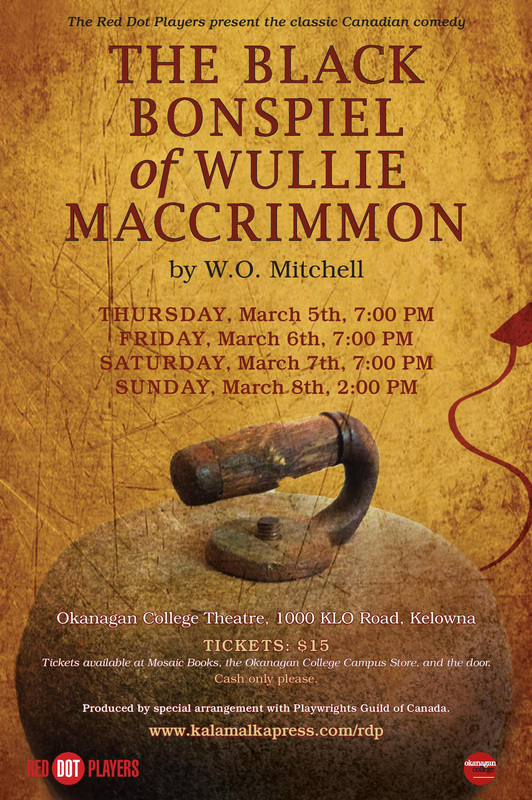 Okanagan College’s Red Dot Players are presenting their first-ever production in mid-March, and have chosen a wickedly funny 18th-Century comedy to use for their debut. The Beaux’ Stratagem was originally written by George Farquhar in 1707, and has been adapted by Thornton Wilder and Ken Ludwig (both renowned modern playwrights). The play tells the tale of two young men who find themselves running short of funds and who settle upon a plan to leave London and hunt for a wealthy wife for at least one of them. The two pretend at being master and servant, switching roles as they move from town to town. The Beaux’ Stratagem opens on Friday, March 18th at 7:30 p.m. in the Okanagan College Lecture Theatre at the College’s Kelowna Campus. It plays Saturday at 7:30 and a matinee is scheduled for Sunday at 2 p.m. Tickets are $15 for adults, $7 for seniors and students. Tickets are available at Mosaic Books, Okanagan College’s bookstores and at the door. The Red Dot Players troupe was formed last fall, when Beaulne and colleagues in the College’s English department realized there was an appetite among students, staff and alumni to flex their theatrical energies, talents and ambitions. “Today we have more than 30 volunteers who are finding that opportunity for self-expression that we hoped this troupe and play would provide,” says Beaulne.